In the old song, “April Showers will bring May Flowers” but what happens if it doesn’t rain in April. Our bizarre weather patterns gave us a hot March a very cool April and almost no rain. I solved the problem by running my sprinkler for three hours over the non-growing Asparagus and the bed where the peas etc are planted. The sprinkler did a bit of good but the nice rain we had that night did more good. If you want it to rain then run the sprinkler and the rain frequently follows to make you wish that you hadn’t spent that money on city water. Ahh! The vagaries of the gardening life. There is an upside to the long cool weeks. 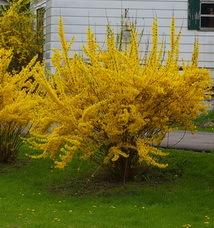 The Forsythia and Narcissus, which bloomed early in the March heat, have stayed in bloom for almost four weeks thanks to the cool weather. The Asparagus, on the other hand, has been a somewhat reluctant performer. The courier should be arriving today with 10 million visitors. The beneficial nematodes that will protect my beloved Iris from the dreaded Iris Borer will show up on a little piece of sponge and they will be released into some water and then distributed over all of the Iris clumps. They have provided excellent control for a few years now and make the growing of Iris even more pleasurable. They will come with their cousins, on another piece of sponge, that will protect my Camperdown Elm from its leaf miner. They also work on Birch Leaf Miner. I get these wonderful microscopic helpers from Natural Insect Control a Canadian company located near Niagara. There are similar suppliers in the U.S. 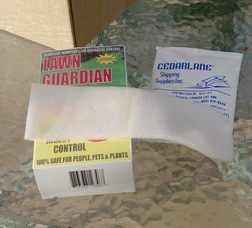 They are a totally safe and organic method of controlling two of the pests that do the most damage in my garden. Now if we could just get something similar to attack the Red Lily Beetle we would all be much happier. It that little red monster is such a pest, why did I plant a dozen new Lilies this spring?? They are always worth the fight! I wrote the first two sections this morning and then made my way to the Toronto Botanical Gardens where Loblaws was putting on their gardening media day. (For my non-Canadian readers, Loblaws is one of our biggest grocery retailers.) Yes, they fed and watered us and gave us a pile of new plants to trial but I would say nice things about them anyway. They are a big retailer that actually, really cares about their lawn and garden products. They are always showing us new and innovative plants and ways of selling them. They also train their store level staff so that the plants are kept in great shape. Not something that is typical of big box retailers. The list of new and different plants is quite long and you can find most of them in the advertising but in this issue of “Dallying” and the next, I will outline some of the things I found most interesting. 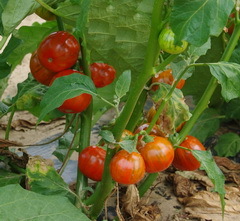 Turkish Orange Eggplant has been around for a while but the garden writers discovered it at Stokes trial grounds last summer and our excitement about it convinced Loblaws to grow and feature it. A delicious oddity. 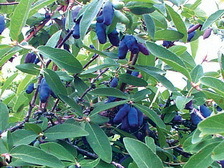 There is an old Canadian native Honeysuckle that has edible berries but nobody cared because the taste was nothing to get excited about. Dr. Bob Bors of the University of Saskatchewan has gathered more than a thousand wild plants to conduct a breeding program and the result is the Haskap berry. Very hardy, very early and tasting like a cross between a Raspberry and a Blueberry with a hint of Saskatoon berry thrown in. This berry grows on a 1 - 2 M tall bush that is, itself, an attractive garden subject. They should fruit next year if you plant the shrubs that Loblaws is offering this year. An important note is that they are not self pollinating. The Loblaws’ garden centres will have them in three different coloured pots, to indicate different varieties and you need to plant at least two of these to successfully produce fruit. I’m looking forward to a bit of the Haskap Berry jam they gave us, as a sample, on tomorrow morning’s toast. I’m already overwhelmed at the amount of planting and fiddling that I have to do in my garden. The apparently early spring has been so cool these last few weeks that venturing into the garden has had limited appeal. I did get the side bed weeded and some of the new Lilies planted there. Then I tried an experiment. Corn Gluten is being sold as a weed preventer but its action is to prevent germination. 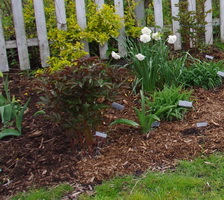 I weeded the side bed planted the Lilies and then generously spread some gluten on it and covered it with my mulch. If this works then any new weed seeds should not germinate and that bed should stay clean and weed free all summer. That, of course, won’t stop the Gout Weed from sneaking over from my neighbours yard. I’ll let you know if the theory works. So! If I have this much to do in the garden already then why did I let myself bring home so many plants from today’s media lunch. We inveterate gardeners just cannot show any restraint when we are presented with an amazing array of interesting plants and they were free for us to take and try. Now comes the hard part. Where will I actually put them. The annual flowers will always find a home in my many containers. Among the big, bright and colourful, I was drawn to a smaller but very interesting flower with two colours on each of its petals. The Lanai Verbena, Twister Pink, will be a quiet sensation in the wall planters along the side yard fence. They did not shout and scream like some of the showier plants but their delicate foliage and two toned, pink and white, flowers appealed to my love of the unusual. Sharon Asks? Do you know anything about a new product being offered by a local Tree Service called “Ace Cap”? It apparently is a new product that is successful, so they say, at killing off the Emerald Ash Borer. The product I am familiar with is Tree Azin but it is obviously more expensive but is a proven product. Ken Answers! AceCap is not a new product but has been around for a few years. I am not personally familiar with it but it is distributed by Tree Care Products, a U.S. company. Their website, www.treecareproducts.com, provides some information and indicates that it will work on Emerald Ash Borer. You should do a little more research, contact the City’s arborist to see if he knows anything about it before entrusting your large Ash tree collection to it.